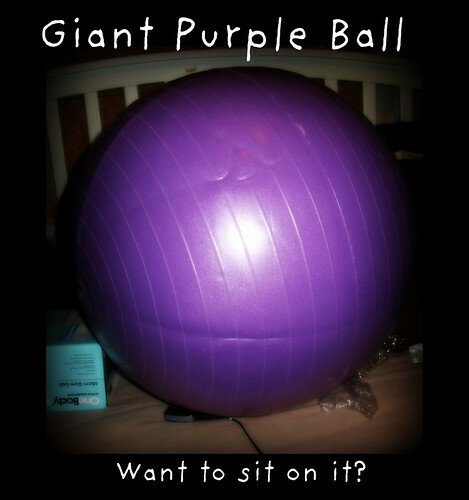 The Giant Purple Ball is now an essential part of my get fit for charity powerwalk, that is happening this June. I have not figure out how exactly its an essential part just yet, apart from the fact that I just knackered my arm out pumping up the bugger. Aha! I have one of those. Mine is black. I have one and they are great for stretching yourself out. Beware of the learning curve however. Quite a few dumb spills and slips taught me the hard way how to use it! Trying to blow it up would keep you fit. That ball has all sorts of core strength possibilities, but one of the best uses is for anyone with a back problem. Just put it between two places where you can stabilize your hands (like two counters) and then bounce. It stretches out the spine with little effort and really helps. Aha! Jamie gave me a great idea! BTW, mine's turquoise and I don't quite know what to do with it yet. I should probably buy a helmet.